Would you believe none? Contrary to popular myth, not one slave was freed when this Presidential Proclamation was made. It was not until the 13th Amendment to the Constitution was passed in 1865 that it actually became illegal to own slaves. 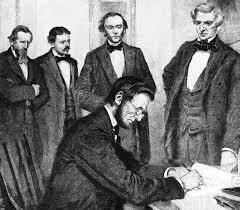 On September 22, 1862, Lincoln signed an order that supposedly set slaves free. But he didn’t free a single slave in the North, where he had authority. He only “freed” slaves in Southern states, where no one recognized his authority. So absolutely nothing happened. Well, not quite. It made him a rock star in the Republican Party, which had been agitating for emancipation for years. It made the Democrats hate him even more because it gave him the moral high ground. But neither Party seemed to realize that nothing had actually changed. You can read the entire letter by following the LINK below. Lincoln’s own words make it clear that his pursuit of the Civil War had nothing to do with doing away with slavery. Yet the textbooks our children study make it seem that it was all about freeing slaves. Why the dichotomy? You have to remember that Lincoln, like all presidents, was first and foremost a politician. But America has an unfortunate tendency to bestow almost godlike status on presidents who have been assassinated. Look at John F. Kenndy. In many ways, he was a good man, and he was a great orator. But he was also a notorious sinful womanizer and adulterer. But we forget all that. America has made him a saint, and no one is allowed to say a negative word about him. Lincoln was a good man, as well, although he was flawed, like all of us. But we need heroes, so we have re-written history to bestow virtues and heroic actions on both these murdered presidents. To challenge their legends in any way is to be labeled unpatriotic, and possibly mentally deranged. The Civil War broke out in April of 1861. When public sentiment allowed it, Lincoln planned to issue a proclamation regarding slavery and he discussed this with his war cabinet in July 1862. They persuaded him not to do so until after a significant Union victory. Lincoln went along with this purely political calculation. It wasn’t until the Union won at the Battle of Antietam that he finally issued his proclamation. The major flaw in the Emancipation Proclamation is that it only freed slaves that Lincoln could not free – those in the ten Southern states that were still in rebellion against the Union. So unless those slaves could free themselves and make their way through the war-ravaged South to one of the Northern states, the impact on them was solely symbolic. Why didn’t he include Northern slaves in his proclamation, so that it would have made a real difference rather than a political statement? It was politics again. If the war was all about slavery, why did many Union officers own slaves? Did the North have clean hands in the matter of slavery? Absolutely not. Percentage-wise they had far fewer slaves than did the Southern states because more of their economy was industrial rather than agricultural. For instance, in the 1860 US census, Maryland, a Union state, had 687,049 people, of whom 87,189 (13%) were slaves. The Southern States had much larger percentages of slaves. But the North had farms, and they used slaves on them, just as slaves were used in manufacturing plants. Interestingly, although only 3% of the families in Delaware owned slaves, the state refused to ratify the 13th Amendment, which abolished slavery, until 1901! The Constitution would never have been ratified unless the framers had promised a “Bill of Rights.” This is because the Constitution as originally written would have made the federal government all-powerful, and many states said they would not ratify it until the rights of the states and the people were protected quickly. So the first ten Amendments, known collectively as the Bill of Rights, are considered to be a part of the Consitution proper, even though they were ratified a few years later. The Northern states, by virtue of their larger population and greater economic strength, dominated the federal government. There was great resentment in the South over the fact that the Northern states received more federal benefits that those in the South, and were generally treated better by the central government. This is similar to what caused the breakup of the USSR – Russia was the dominant state, and the other republics of the USSR were treated poorly. But the greater issue was the right of self-determination by the states. We have lost the concept of the union that formed the United States. Each of the original 13 colonies was a sovereign government – a State with its own Constitution and laws. Worldwide, a State is considered to be an independent government, such as the State of Israel or the State of France. That was true at our founding. Why else did we have the “Commerce Clause” in the very first Article? It stated that Congress would have the power "To regulate Commerce with foreign Nations, and among the several States, and with the Indian Tribes." If we were all one big happy nation, why was it necessary to regulate commerce between States? In fact, taxes and duties were charged on commerce between States. Today the concept of State’s Rights has been degraded to the point where most Americans consider the States to be nothing more than political subdivisions of the United States, much like counties are political subdivisions of States. But that was never the intention of the Founders. Some vestiges of State’s rights still exist. For instance, many States have differing criminal and civil laws. And a fugitive from one State cannot be returned to the State where the offense was committed without permission from a court in the State to which he fled. Of course, slavery was one of the many issues that concerned the States that seceded. They believed that since slavery was not prohibited in the Constitution it was up to each State to decide on whether or not it would be allowed. Even Lincoln said the federal government lacked the power to force emancipation on the states. A modern-day example of this is the problem of homosexual marriage. This is not mentioned in the Constitution. (The Founders would have shuddered in horror at the thought.) Although the federal government attempted to define marriage in the Biblical manner – between one man and one woman – ultimately the States decided the issue individually. What does that phrase mean? A better Union than that provided by the Articles of Confederation? Bringing the States closer together? Fixing some of the weaknesses in the Articles? One thing it doesn’t mean is a “Perpetual Union,” or that phrase would have been borrowed from the Articles. The US Supreme Court declared in Texas v. White in 1868 that secession was illegal. But in my opinion, that ruling was much more political than constitutional. We had just been through a terrible Civil War. For the Court to rule in any other way would have been to invite more violence. It is interesting that the Court stated that, “When Texas became one of the United States, she entered into an indissoluble relation.” It gives no constitutional citation for that claim. Apparently, just because some men in black robes said it, that made it true. But the Supreme Court has been proven wrong many times in the past and is in no way infallible. The other interesting part of this decision is the sentence, “There was no place for reconsideration or revocation, except through revolution or through consent of the States.” This indicates that secession was possible (even in the opinion of the Supremes) if the central government agreed to it. In truth, our nation was formed by the secession of the original Colonies from England. They were legally just that – Colonies of England. What gave them the right to decide that they would leave England and become individual nation-states, and to unite those nations as the United States? And if they had that right, what forbade the Southern States from exercising the same right? The idea of secession didn’t start with Texas’ attempt to secede in 1860. Far from it. In fact, three of the original 13 States (Virginia, New York, and Rhode Island) only ratified the US Constitution conditionally. They each explicitly retained the right to secede. If the federal government allowed those three states the right to secede, does it not follow that the others had the same right? By the start of the Civil War, we were already essentially two nations with one name. The tensions and strife between the North and South were political, economic, and emotional. It didn’t take much to set fire to all that dry brush. The terribly sad truth is that the Civil War was unnecessary. 625,000 Americans died in this senseless war – more than the combined totals of Americans killed in both World Wars. But if the politicians – including Lincoln – had worked to de-escalate the tensions between the Northern and Southern states I believe a peaceful outcome could have been had. More and more Southerners were coming around to the abolitionist way of thinking. I think that eventually, the Southern States would have abolished slavery on their own. Much of the world had come to the conclusion that slavery was immoral (as had Robert E. Lee), and leaders like Lee would have persuaded their fellow citizens to that viewpoint. But, contrary to the historical revisionists’ falsehoods, one of the greatest causes of the conflict was economic. The South had a one-crop economy based on cotton – always a dangerous situation. Their primary market was the Northern States which turned the cotton into textiles and clothing. They colluded to keep prices low, which meant that the only way for Southern farmers to survive was with the use of slaves. The Union could have done many things differently. It could have helped the South develop industry and alternative crops. It could have freed its own slaves as an example. It could have helped keep communications civil between the two halves of the nation, rather than using inflammatory and insulting language, both in its newspapers and in Congress. Our great nation was founded on the right of self-determination. It became less great when it allowed political considerations to override its humanity, with the result that 2/3 Million Americans died needlessly, and millions more were injured. If the federal government had acted differently, it is doubtful any State would have seceded. And if one or more had, they could have been brought back into the fold with proper inducements – just as we induce other countries today to become or remain our allies.